In my recent years of seeking to become closer friends with people, I’ve gone from being very reserved to being a little too chatty. And you know, some things really are better left unsaid. So my husband’s been coaching me. He told me that I don’t have to feel a need to explain everything to everyone. That it’s okay to not thoroughly answer every question I’m asked. If someone asks why you’re doing something a certain way, simply reply, “It works for my family.” Then ask the person how they’re doing. If someone continues to press for further information but it’s not an appropriate time to leave, it’s okay to say, “I’d rather not talk about that.” Then change the subject to something more neutral (the weather, anyone?). That’s it. And when I tried to give “buts” or “what-ifs” to my husband, he said no. That’s it. Don’t talk too much. You don’t need more responses because these are enough. But while these ideas are fantastically simple, they can be a little difficult to actually execute if you’re used to answering prying question. That’s where role-playing can be helpful. Have a close family member or friend ask you a few prying questions so you can practice politely heading them off. Not everybody has bad intentions. Sure, some people may want to gossip, judge you, or offer their opinion to your situation. But other people are truly concerned, curious, or are dealing with a similar situation in their own lives and looking for someone they can talk to. Start out by assuming the other person’s intentions are innocent. Don’t start a conversation with a hot-button topic. My husband gently informed me that I sometimes accidentally get myself into a corner by casually mentioning something that’s a hot-button topic. I now realize this should be common sense but it was a pretty eye-opening observation to me. In other words, I need to think about how my words may be perceived before I speak. Treat people kindly. Notice that I didn’t title my post with something like, “Five snappy comebacks for when people get too nosy.” That’s because I don’t think we should offer snappy comebacks or rude retorts. We can honor the privacy of our families while still being polite. Expect from someone what they’ve shown you to expect in the past. This may be the best advice my husband has ever given to me. It was another one of those, “Why didn’t I realize this sooner?” moments. Think about how this person has responded to various situations in the past. Has she been helpful and kind or judgmental and gossipy? Yes, people can change. And I fully believe in offering grace to others. But we also need to be careful to protect ourselves from unnecessary grief that can be caused by offering too much information. What about you? 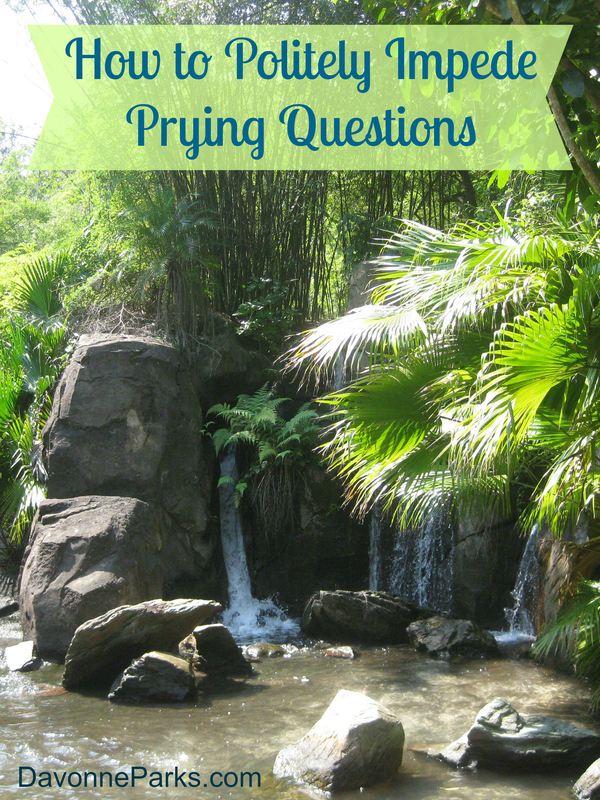 How do you politely head-off prying questions? Thanks for this article. My husband tells me the same thing that I give out too much information. This especially happens when speaking with a cousin of mine. She asks me questions and wants me to answer a certain way then proceeds as if it’s the Spanish inquisition. When I ask her about her family it’s usually just the same as what your husband said…one sentence responses. Yet she proceeds to ask me a million questions about my family (smile). But I have been learning to answer her vaguely and not volunteer any further info which I am accustomed to doing. In fact, I call her less and just prefer to chat online or via email which helps. This way, I have more control which I lack during a telephone conversation. I miss chatting with her but I get anxious about all the flurry of questions and think it’s not worth it. Another important lesson is that when someone asks you something you are really under no obligation to answer at all. I remember an elder asking me something and I felt like I owed them a response out of respect. However, when I asked the person a question in return they flat out told me that they are under no obligation to answer. That was an unforgettable experience. Just remember, you don’t have to answer. Paulie, I am sorry you have gone through those situations with your cousin and an elder. It is so good that you are learning from your experiences though. This is excellent advice – thank you so much for contributing your thoughts.